Reusing animation and assets is an important aspect of cut-out animation. This is why Harmony includes a library for storing all of the reusable information. To save time, you can take an action which you have already animated such as a walk-cycle or jump and use it again. You can store the initial animation in the Library view, then select and drag it into a new scene as often as you need it. You can import a master template into the Timeline view and start animating with it, then later on decide to import an action template. You can import the template into the window on the right side of the Timeline view. This is where all the keyframes are located. An action template is a template that allows you to store drawings (like a blink) or keyframes (like a walk cycle) that you want to reuse in an animation sequence. To insert a template into another one, the layer ordering has to be the same. If it is inconsistent, the system will indicate that the templates cannot be combined. In that case, you could bring the action to the Timeline's left window to create a new set of layers or convert it into a symbol and drop it into any layer. You can create a single keyframe action template of the different viewpoints (front, three-quarter or side view). Then import and insert those action templates into the animation to turn the character. The same pattern can be created for a head, arm, full upper body, etc. If the master template you are importing was created in the Network view, make sure to import it first and to drop it into either the Network view or the left side of the Timeline view. Failure to do this may break some network connections. If you created templates for different body parts you can reuse them in your scene by dragging them in your layers. 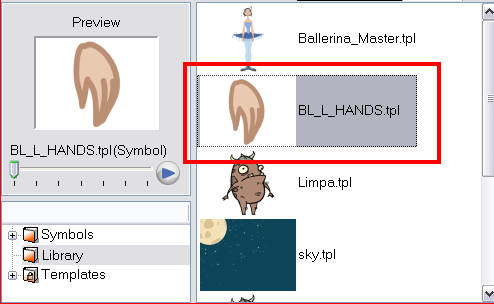 You can also open a template as a folder and select a particular drawing from it and drag it into your drawing layer. If your layers are symbols, you will need to drag the templates inside the symbols. 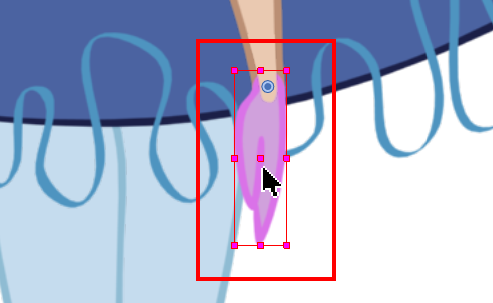 When you import extra drawings, such as different hand and mouth positions, use the pivot that was set on your drawings and copy them to the symbol's cells. You can do this by using the Copy Pivot to Parent Symbol command. When you copy your pivots to the parent symbol, there is no link between the drawing's pivots and the symbol's. It is simply a copying operation. If you modify the drawing pivot later, it will not be copied to the symbol and you would need to perform the operation again. If you need to modify the symbol's pivots, do it directly on the symbol's cells. 1. In the Camera or Timeline view, double-click on the symbol you want to add new drawings in. 2. In the symbol's timeline, extend the length if necessary. 3. In the Library view, browse to the template containing the new drawings to import in your symbol. 4. From the Library view, drag the select template and drop it into the Timeline view's right side into the corresponding layer. 5. In the Tools toolbar, select the Pivot tool. 6. In the Timeline view, select the new drawings you just imported. 7. In the Tool Properties view, click on the Copy Pivot to Parent Symbol button. ‣ If the pivots were not set on your drawings, use the Pivot tool to set them before performing the copy operation.